Any good trainer will reinforce that with his fighters because you never know when you might get the call that could change your life forever. And the ones who are dedicated, the gym rats who stay in fighting shape even without a fight lined up, are the ones who will capitalize. After tonight, you can add Daniel “Alacran” Lozano to the list of fighters who stay prepared. 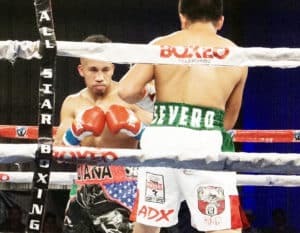 In a stunning upset, Lozano (14 – 4: 11 KO) defeated former champion, David “Severo” Carmona (20 – 5 – 5; 8 KO), with a knockout 2:33 into the second round to win the vacant WBO NABA Super Flyweight Championship in the main event of All-Star Boxing’s “New Generation” fight card held at Osceola Heritage Park in Kissimmee, Florida Friday night. Jose “Chiquiro” Martinez, the current WBC Latino Super Flyweight Champion withdrew from the fight after Carmona weighed in four pounds over the limit. A testy exchange ensued between Carmona and Martinez’s trainer at the weigh-in when Carmona shrugged off the violation as no big deal. 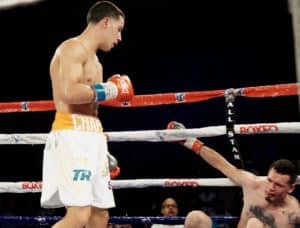 The fight, which was to be featured on Telemundo’s Boxeo Summer Series Grand Finale, was then called off late Thursday. Enter Lozano. With less than twenty-four hours to prepare, he rocked Carmona with a sweeping left two minutes into the second round. Badly shaken, Carmona willed himself off his back just in time to beat the count, but he was obviously still hurt from the punch. Moving in quickly to finish, Lozano threw a rangefinder left hook that surprisingly landed clean, before unleashing a right that caught Carmona on the top of the head and dropped him to the canvas for a second time. And suddenly, Daniel Lozano was a champion. In the lead-up fight to the main event, Top Rank fighter Jean Carlos “Chapito” Rivera (12 – 0; 7 KO) continued his impressive streak of victories with a third round TKO of Juan Carlos Benavidez (7 – 10 – 1; 4 KO). Rivera, from Bayamon, Puerto Rico, landed a sharp right hand in the first round that put Benavidez on the canvas. After a quiet second round, Rivera came out strong in the third, landing a hard body shot that hurt Benavidez before finishing him with an impressive left uppercut – left hook combo just under the two-minute mark of the third round. In the preliminary bouts, Manny Woods, Jr. (16 – 6; 6KO) from St. Pete, FL, landed a crushing, straight right to drop Danny “Bebo” Pastrana 1:38 into the second round of their middleweight clash. After the feeling-out opening round, Woods’ corner must have sensed something as he came out swinging from the outset of the next round, stunning Pastrana with a power punch moments before catching him coming off the ropes with a clean shot to the chin. The other Top Rank prospect on the card, lightweight Henery “Moncho” Lebron (3 – 0; 3KO), from Aguadillo, Puerto Rico, crumbled Oscar Quezada Mendoza (5 – 4; 2KO) from Aguas Prieta, Mexico with a devastating body shot 2: 19 into the first round, a shot that left Mendoza rolling on the canvas long after the fight was called. In the opening fight of the night, Noe Lozano (2 – 1) from Ft. Pierce, FL won a split decision, outpointing Daruma Almenarez (1 – 2; 1KO) from West Palm Beach, FL in a closely contested 4-rounder.